With periods of rain and wet snow since late March, drought conditions earlier in the season have subsided across nearly all of Colorado, and only a small portion of southwest Colorado remains abnormally dry. At the start of the year, nearly ten percent of the state was abnormally dry, and conditions deteriorated during the first three months. 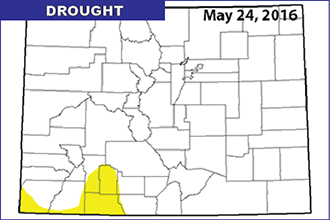 Large areas of southeast Colorado dropped into moderate to severe drought while the remainder of the region was abnormally dry. Regular storms and cooler temperatures during the early spring months quickly reversed the trend in much of the state. As of the current report, only Mineral and Archuleta Counties are completely impacted by abnormally dry conditions. 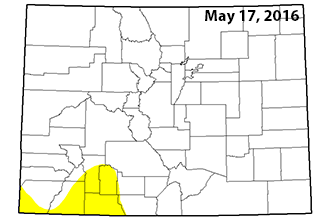 Smaller areas of Conejos, Rio Grande, Hinsdale, La Plata and Montezuma Counties are also affected by abnormally dry conditions. The remainder of the state is reporting normal conditions. While the state has escaped the drought conditions present one year ago, the wetter weather has introduced new problems for producers, such as Stripe Wheat Rust. Precipitation is expected to continue Thursday, with strong to severe storms in the eastern part of the state. Rain will continue Friday in Kiowa County, and chances of thunderstorms will persist through the Memorial Day weekend.